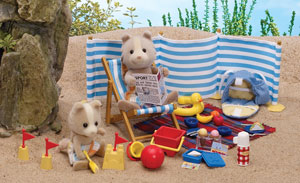 Safe behind his wind break, Harley Farthing loves reading the newspaper on his deck chair in the sun while his son Vespa happily builds sand castles on the beach, plays ball or goes for a swim wearing his rubber ring. They have a picnic packed in their rucksack with sandwiches, fruit and ice cream, plus a flask of tea. What a great day out!